Serve More is on a mission to empower people to love their neighbors by renewing the communities of central Oklahoma. It's been an amazing week around here! Sure, we've been excited about gearing up for Christmas and looking forward to spending time with friends and family. But as you well know, Janneh and his family are still splitting time between home (with four siblings) and the rehabilitation hospital (where Janneh has been for several months). But check out what happened today! That's right! The ramp and patio are done and they both have Janneh's Seal of Approval! It's been a wonderful Christmas Day celebrating all the early progress of our efforts to #BringJannehHome. Not only did Janneh get to test our the new ramp & patio, he got to have Christmas dinner AT HOME with his family, and even watch the OKC Thunder go up against the Chicago Bulls. Guys. I cannot explain the sense of joy and relief that was palpable in the house. Having Janneh home for a few hours today was the cause of many smiles, photos, and neighbors dropping by to say hello. The best part about all of this — it's just the beginning. During the visit, our general contractor Kendra from Home Mods by Therapists got to walk Janneh through the changes to his bedroom and home. All in this has been an amazing week working to #BringJannehHome. Already Janneh and his family are absolutely blown away by your generosity. They just can't stop saying how thankful they are for each and every one of you. The next few weeks are going to be busy with new doors and windows being custom built, color consultations to find the best mix of color for Janneh's new room, and some additions to the patio of a roof and some low, brick walls. We'll keep you up-to-date all along the way. So you're done reading this. You're feeling great because there's good in the world. Well SHARE that feeling! Help us spread the word by clicking that "Share" button below and get busy! Just one week ago, we introduced you to this young man. You heard the heartbreaking story of a bullet that paralyzed him just shy of his thirteenth birthday. You heard that he's a good-hearted boy who wanted to meet Russell Westbrook for Christmas. And you heard of the immense hurdle his family faces to bring him home — $80,000 in repairs, travel, and equipment. And then — you got busy. In the seven days since we launched our campaign to #BringJannehHome you have raised almost $10,000! You've pledged your time and your services to help make it possible for Janneh to come home! You have tweeted and written to Russell Westbrook, asking him to visit Janneh — WHICH HE DID! Folks. Let us tell you — Janneh was starstruck. For a kid who talks a big game, he was speechless. But Russell hung out with him for about half an hour. He also brought a signed pair of his basketball shoes and his Sunset-Orange Jersey for Janneh to keep! We've definitely hit the ground running to #BringJannehHome but we still need help. If you haven't already, jump in by pledging your time, giving cash, or providing a product or service. Volunteer work will start at the home after the first of the year. Know people who can help spread the word? Get them connected! Just like anything else, we'd rather do cool stuff with friends. Let's go! I want you to think about this number. It's a big number. Half a million dollars. I don't know about you, but that's more money than I've ever had in my lifetime. Get this. Serve Moore Volunteers saved our neighbors more than HALF A MILLION dollars this year! 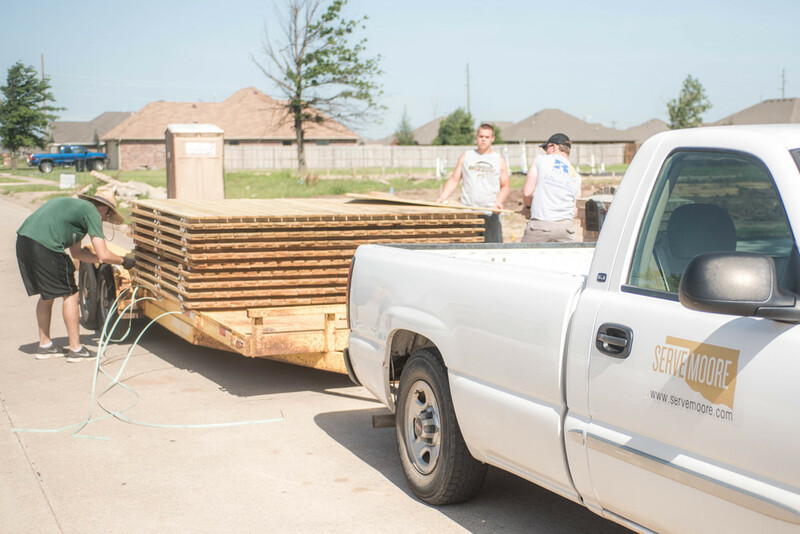 By connecting people who need help with free labor and donated materials, we have renewed 287 homes in the Oklahoma City metro. That's stupendous. Now think about this considerably smaller number. Not even half of that first number. In fact, it's less than a third. This is all it takes Serve Moore to mobilize and coordinate those volunteers and materials to renew homes and lives all over central Oklahoma. What's more — every one of those dollars comes from donors. Donors have graciously and generously given 100% of our operating budget. Let's just say that we're blown away by this. These gifts make it possible to bring teams of hundreds to project sites, to provide materials when a family has nothing, to continue the incredible work of renewing homes and lives. What's all this mean? Well, it simply means that Serve Moore generates $3 in benefit to the community for every $1 donated. So #WeAreThankful for donors. For their commitment to generosity. For their support of this great work. Guys and gals, we simply could not do this without you. Not yet one of our donors? Well, we can fix that! Serve Moore Donors make the work possible. Their pledges and gifts keep the train on the tracks and keep the hammers swinging. They're a great group of people and you can join today. If you've been following along this week, you know that we're celebrating a Week of Thankfulness where we focus each day on an aspect of our story and why it's so incredible. Today is no different. Partnership is at the very core of what Serve Moore is as an organization. We are committed to the process of working together with others to affect a greater good in the communities we serve. Partnership is so foundational to Serve Moore because it was the very first thing we did. Even before the hashtag and thousands of volunteers — Serve Moore was a group of friends and neighbors from local churches. We knew two things. First, we wanted to connect the people who needed help with the people wanting to give help. Second, we wanted to work together to do more than we could have apart. And you know, that's really all you need for partnership — a common goal and willingness to work together. What started with a group of friends from several churches has grown into a vibrant and innovative nonprofit. But the idea of partnership has never dimmed. Serve Moore is only what it is today because of our partners. Partners like Covenant Life Assembly donating use of their gym, the City of Moore donating use of their former police station, companies like Starbucks and Chick-fil-A of Moore who believe in our mission and support it in many ways, and churches like Life.Church Moore and Emmaus Baptist Church who have continued their partnership efforts with manpower and money. All these partners and many more make it possible for Serve Moore to #RenewHomes & #RenewLives and frankly — we couldn't possibly be more thankful for each one of them. If your organization shares our vision of renewed homes & lives, you should consider partnership with Serve Moore! We bring help to thousands of metro households a year but we could do even more with your support. You can email chris@servemoore.com to start the conversation. We're reflecting on the many things for which we're thankful this week — a Week of Thankfulness of sorts. As we've thought about the many groups of people for whom we're thankful, an interesting thought came to mind. We're very thankful for the many thousands of people whom we serve! It might not seem immediately obvious why but let us explain. When we're referring to people who need or use our services, as a team we've agreed to never use the word client. There's nothing wrong with the word inherently. Many nonprofits use the term to great success but we've never felt like it was very "us." Right from the start, the people in need have been our neighbors, friends, and fellow residents of the communities we serve. While it may not be the most business-savvy decision, we use any of those words before we call someone a client. So we're thankful for our neighbors. You trust us during some of the hardest times in your life. You trust us to treat you with respect and love. You trust us to be good neighbors. Serving you by mobilizing people to help renew your home is one of our greatest honors. We've always agreed that running Serve Moore would never be a "job" but had to be a "calling." Every single day, you make that calling possible with your trust and patience. For that, #WeAreThankful. Sometimes we take for granted that we know Serve Moore's story so well. We've lived it every day for more than two years. A few days ago, however, I got to tell the story to someone who had never heard it. That got me thinking. We have such an incredible story because we have so much for which to be thankful! So here it is — our Week of Thankfulness — our chance to express just how deeply grateful we are for this incredible story. Our story began with people. 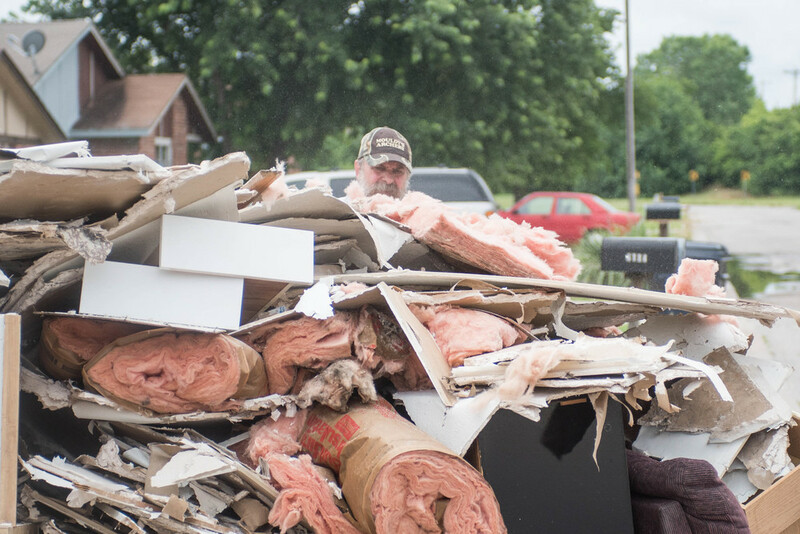 What started as about 50 of our local friends wanting to do something — anything — to help those hurting after an EF-5 tornado tore through our communities turned into more than 50,000 people giving their time to help us recover. We never could have predicted that inviting people to #ServeMoore with us would result in so many people answering that call — let alone that a nonprofit passionate about serving and loving people would be born out of that movement. We are thankful for the tens of thousands of volunteers who have given their time to the people of central Oklahoma. You are our first and greatest resource as a nonprofit. You are the reason we are able to do what we do. And you will continue to be the key to connecting the people who need help with the people who want to give help. In January, Serve Moore will begin to organize and train local, individual volunteers to work to renew homes and renew lives. So thank you for inspiring us. Thank you for being the beginning and the continuation of this incredible story. If you're local to the central Oklahoma area and you're interested in volunteering regularly with Serve Moore, give us your contact info and we will email you in January with dates for our Volunteer Launch events! On their last day at Serve Moore HQ, a few of our Summer Interns snuck in one, final blog post. It seems they wanted the world to know what they thought of their summer spent serving those who came to serve. I'll just leave these thoughts here, untouched, as they presented them. The only thing I'll add — every day it becomes increasingly obvious to me that the renewal we began working for more than two years ago spreads to every heart and life this movement touches. As our Summer 2015 internships come to a close, some of us wanted to write a message of thanks to Serve Moore, Chris, Michael, and the rest of the staff that has made our summer so great! As my first internship comes to an end, I could not have been more blessed to be in any other place than here at Serve Moore. I learned a great deal of patience and to live organized in a disorganized world. But most of all I learned how to love people the way God wants Christians to love people. Chris, Michael and the rest of the Serve Moore team showed me how to love strangers and in a way that was selfless but enthusiastic. Helping people find home when all is lost and helping them feel more secure in their living conditions is what they are about. This time alone has only fueled my own passion to help others. So, I'm thankful for the opportunity that I had and for the people that I've met. And I’ll keep the same drive from this summer to use the rest of college and on to the rest of my career. This summer working with Serve Moore has been one of the best I remember. This has hands down been the best internship I've experienced! Instead of finding people to fill in roles, Chris and Michael looked at us to find out how best we could benefit the organization. On top of that, instead of just doing specific jobs, we were asked to give our opinion, given the opportunity to share our ideas, and the freedom to make the internship as rewarding as we wanted. I definitely won't forget all the entertaining stories told over lunch, project runs with my fellow interns, or how much I learned about serving communities! When you tell people you are an intern, they immediately go to think you’re getting coffee and making copies. I’ve been told internships are meant to be unglamorous and are there for you to “pay your dues.” For those of us fortunate enough to intern at Serve Moore, we know this to be untrue! Working at Serve Moore taught all of us to think on our feet and outside the box, and not be afraid to try new things. I have learned the power of telling stories to help spread Serve Moore’s mission, and I’ve been blessed to hear stories from both families in Moore and the volunteers, and realize how individual acts can build upon each other to make something great! I’ve also learned great life lessons about selflessness, positivity, and teamwork. So, thank you Chris and Michael! Thank you for constant encouragement to push our limits. Thank you for my first Jimmy Johns, ever. Thank you for never letting us have a dull moment, and for being some of the best, most selfless, albeit sassiest people I’ve ever met. And thank you to the entire Serve Moore team, especially y’all interns, for giving me an unforgettable summer! Working as the Nonprofit Management Intern at Serve Moore this summer has taught me several things and has given me priceless experience that I don’t think I would have received anywhere else. I have interned at nonprofits before, but never any as new as Serve Moore. I think I learned so much more at Serve Moore than I did or even could with my past experiences because it gave me a chance to help build something from the ground up and watch it grow. Going into this internship I only knew that I wanted to work in the nonprofit sector. I didn’t know what exactly what I wanted to do and in what type of nonprofit work I wanted to be in. Seeing all of the people that Serve Moore has helped over this summer was very fulfilling especially since I got to be a part of that. That is something that I want to keep being a part of and hopefully turn into something that I can do once I am finished with school. So to Chris, Michael, everyone at Serve Moore and my fellow summer interns, thank you so much for this great summer experience. I will be forever grateful for this amazing opportunity to be a part of something so great. This week, Katie and Grant drove with their team from Lexena, Kansas to help out our community. This was their second time coming, their first being the summer of 2013. Two years later, they were able to see the progress made, as well as help out families who were affected by the most recent storms this last spring. When asked about their favorite part of the week, Katie told us about a woman she met while scouting for uncovered needs in a neighborhood. "Her house was hit by the tornado in May. She is crippled, so she was unable to reach her shelter in time." Miraculously, the lady survived the storm! Katie was able to bring comfort by sitting and talking with her, as well as offer hope by informing her about the services offered by programs like Serve Moore. Grant recalled the joy on a homeowner's face when a finished project was handed back over. "We just finished painting the outside of house when he came out to talk to us. You could just tell how grateful he was." What was the most important part of this week? "Definitely interacting with the people!" they both agreed. Volunteers are able to give local homeowners free labor, but the biggest gift they offer our community is taking the time to talk with and listen to our residents' stories. It's incredible how much of an impact that truly has on people's lives. "The last tornados were a lot more destructive," Katie said while reflecting back on their first trip. Grant added, "It was heartbreaking seeing that much damage for the first time. But, it's so cool to see all the progress!" You too can be a part of the progress we're making to bring renewal to Central OKC. To hear more stories like Katie and Grant's and find out how, go to www.servemoore.com. What is Volunteerism to You? VOLUNTEERISM: (n.) \vä-lən-ˈtir-ˌi-zəm\ the act or practice of doing volunteer work in community service. But to others, volunteerism means much more. Volunteerism is the chance to help communities, not only with labor, but through emotional relief and spiritual support. Volunteerism gives everybody a chance to truly make a difference in another’s life; to give to those in need, and receive in return. 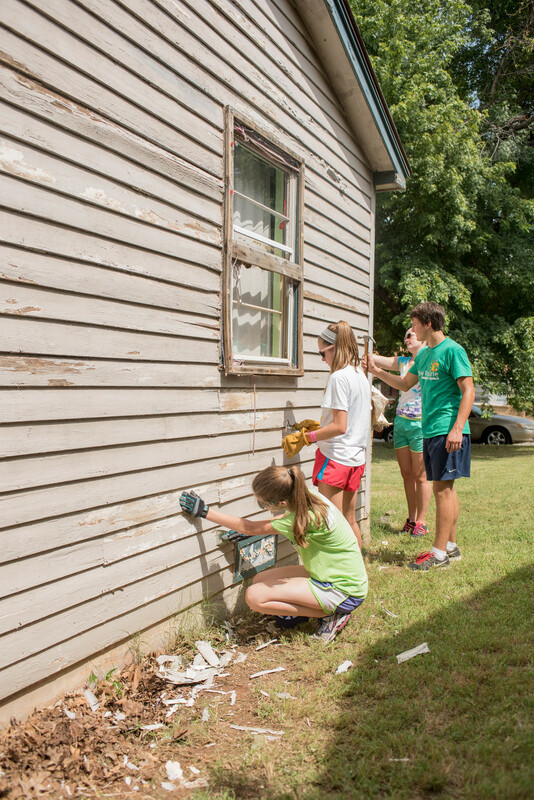 This week, Serve Moore hosted 65 volunteers from Next Step and Kaw Prairie. They worked a total of 1,461 hours on 7 different homes, saving those homeowners over $15,400! Next Step is a non-profit organization committed to helping students grow closer to Christ through a life-changing, one-week mission trip. This past week, the team worked on a project that has been a focus for them for over a month, repairing a roof for a woman affected by the May 2013 storms. In addition to this project, volunteers worked on the other half of this duplex, preventing mold spreading and helping with roof repairs. The last project this team worked on last week was a home flooded and damaged in the May 2015 storms. Volunteers replaced storm doors, several ceilings, and several rooms worth of flooring throughout the home. Overall, Next Step clocked 912 hours and saved local residents $6,781 in labor and materials! Kaw Prarie, whose mantra is “Go forth, give freely and serve,” admirably demonstrated their dedication to volunteerism this week. 27 volunteers from Kansas served almost 550 hours, saving local homeowners $8,665! They painted a couple homes and sheds around the OKC metro, and also helped a resident move some belongings that had been displaced by the May 2015 storms. 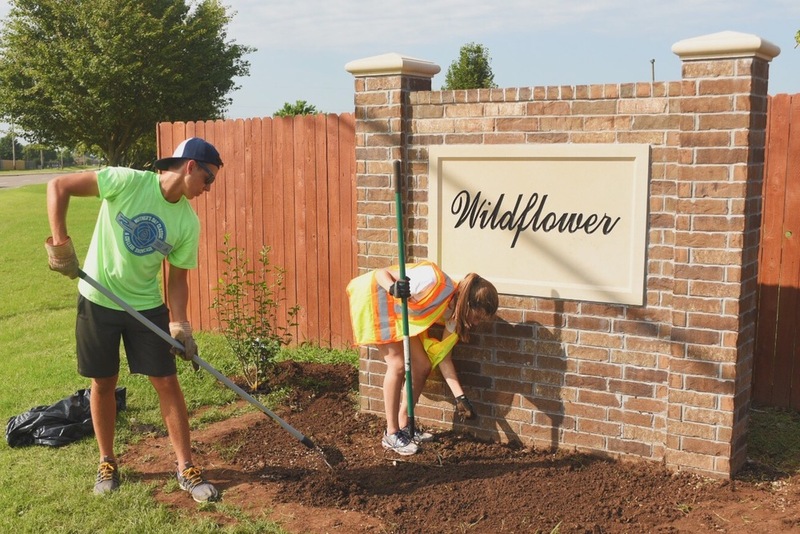 The team also worked with the Wildflower Homeowner’s Association in south OKC, who had part of their neighborhood destroyed in the 2013 storms. Law Prairie helped them by designing and planting flowerbeds. The last project the team worked on was a doozy; a woman in southwest OKC had a solid 5 acres of debris from the May 2013 storms! Volunteers removed 1,100 pounds of debris- but there is so much more to do on this property. 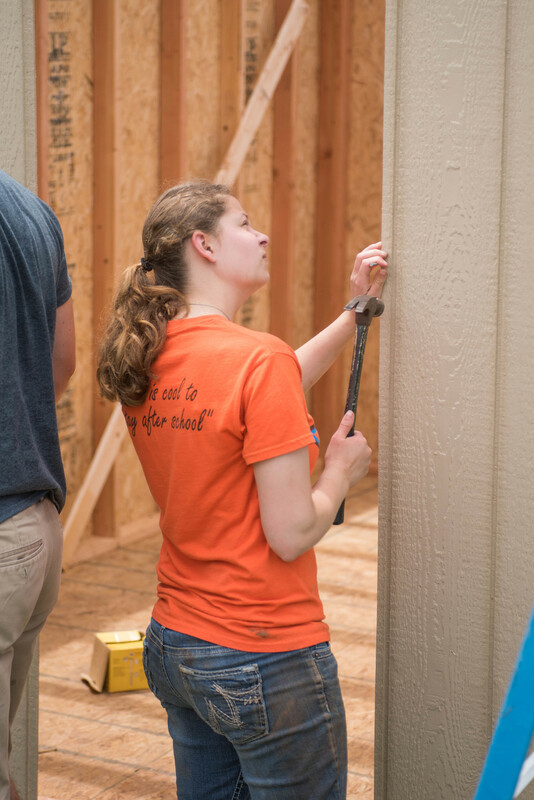 In addition to working on homes, volunteers also helped further Serve Moore’s scouting efforts by visiting over 800 homes and discovering 23 new needs in those communities! These teams volunteered their time, materials and labor to this week's projects, and have changed the lives of local residents. Still, there is more work to be done If you are interested in helping renew Moore in any way you can, whether that be with time or funds or supplies, contact us! Also, if you think you or somebody you know could benefit from our services, visit our website and contact us! Our Biggest [and Hottest] Week Yet! Not only was this the hottest week of the summer so far, but this was one of Serve Moore's busiest! 167 volunteers came from all across the country — some as close as Texas, some as far as Wisconsin! Together. All together, they worked 4,152 hours and saved OKC Metro residents just under $43,000 — all in just four days! Experience Mission, a team of 28 volunteers, clocked in 784 hours and saved residents almost $6,000! They worked on two sheds — painting one, and building an entirely new one for a local veteran who lost everything in the 2013 Tornadoes. They also helped a resident of Moore who was affected by both the 2013 tornado, and the March 2015 storms. Volunteers helped this man repair his fence and clear landscape debris that had been in his yard since the storms hit. However, this homeowner still needs help brushhogging his yard, so if anybody can offer any help, please give us a call! Another Moore resident bought her first house for her family, but before she could move in, had the fence damaged in the March storms. 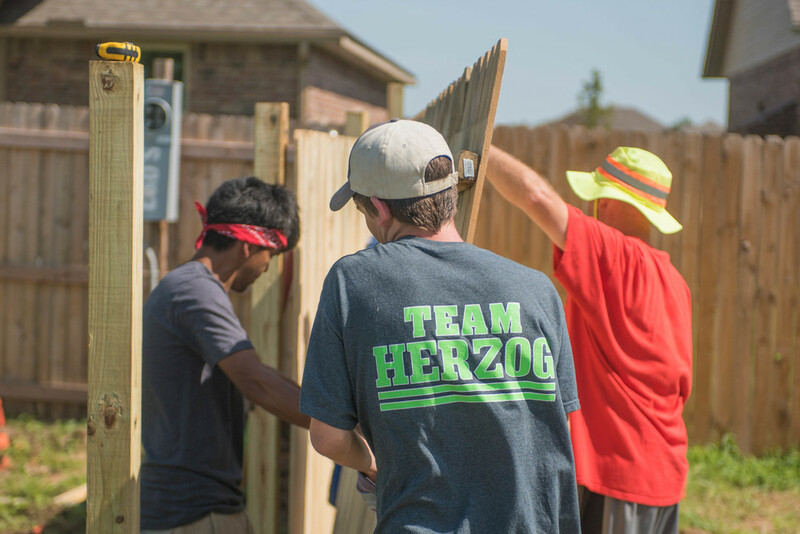 Experience Mission's team repaired the fence and worked on the gate, giving her family a sense of privacy and security in their own back yard. First Christian Kenosha's team of 14 completed 10 projects in only four days, working a combined 392 hours and saving residents $5,337! Showing off their strength, they removed 3,200 pounds of debris from a home, or almost 230 pounds per person! Volunteers repaired a fence for a Moore resident who lost her fence in the May 2015 storms, and hasn't had a safe outdoor space for her grandchildren to play in since. Another homeowner had a huge tree fall during the May 2015 storms, and damage her fence, gutters, and mailbox, all of which the team repaired and replaced. First Christian Kenosha visited two other homes that had suffered damage from the May 2015 storms, as well has helped us out at HQ building shelving in our hand tool room! 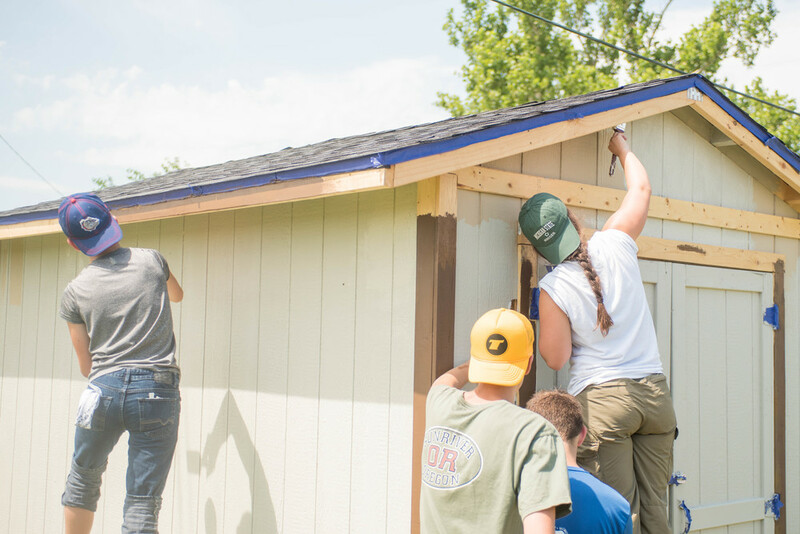 Bounce brought a group of 125 volunteers to replace NINE roofs in just FOUR days. That totaled 2,976 hours and a savings of $31,500! Seven of these roofs damaged in the March and May 2015 storms while two of the roofs were Renewal Projects to help homeowners care for their house. These projects generated more than 16,000 lbs of roof debris and used 433 bundles of shingles put back on. Bounce volunteers also did yard work at these homes improving the general appearance and making a happier place to call home. In the extreme heat, volunteers also found ways to stay inside and serve. Combined, volunteer teams spent 266 hours at the Moore Food & Resource Center, saving them $3,724 in labor! Experience Mission served 6,533 meals to 286 people, while First Christian Kenosha served 2,777 meals to 118 people. A major focus for Serve Moore volunteers this week was scouting neighborhoods. Both Experience Mission and First Christian Kenosha went door-to-door to over 1,000 homes this week, looking for needs to be met. From these interactions with homeowners, volunteers discovered almost 100 new needs that we can help with! To read more about our scouting teams and what you can do to help, visit our last blog post here. Even though Serve Moore volunteers give invaluable time, energy, and dedication to renewal in our area, some find other ways to help those in need. Serve Moore would like to give a special thanks to Emmaus Baptist Church, Church of the Harvest, and The Salvation Army of OKC for donating materials and funds to help keep volunteers going! Also, thank you to the homeowners who helped volunteers help them by providing materials and found savings in free labor. If you are interested in helping in any way you can, whether that be with time or funds for supplies, or if you are looking for somebody to ask for help, please contact us! Your neighborhoods have been affected by natural disasters and some have yet to receive help- and we know that. To reach out to these homes, Serve Moore is sending out scouting teams to various areas of the OKC metro, literally going door-to-door asking people how we can help. Volunteers’ mission this week is to go out and reach people who need help, but haven’t for various reasons. Maybe they don’t know who to ask, how to ask, or what to ask for. Scouting teams are there to explain Serve Moore’s mission, services, and let homeowners know that there is no need too insignificant. Serve Moore’s mission is to mobilize people to love and serve Central Oklahoma. Our dream is that through the tragedy of natural disasters and the extraordinary good we’ve seen since, renewal would be sparked in our community; Renewal which spreads to every part and to every person, bringing both healing and growth. We want the Gospel and its unmatched renewing power poured out here in Moore and the surrounding areas. Many needs remain unmet — some storm related and some not. If you have a neighbor, family member, friend, or other loved one who you feel needs help, and they’re unsure of where to go or who to turn to, please let them know about Serve Moore. 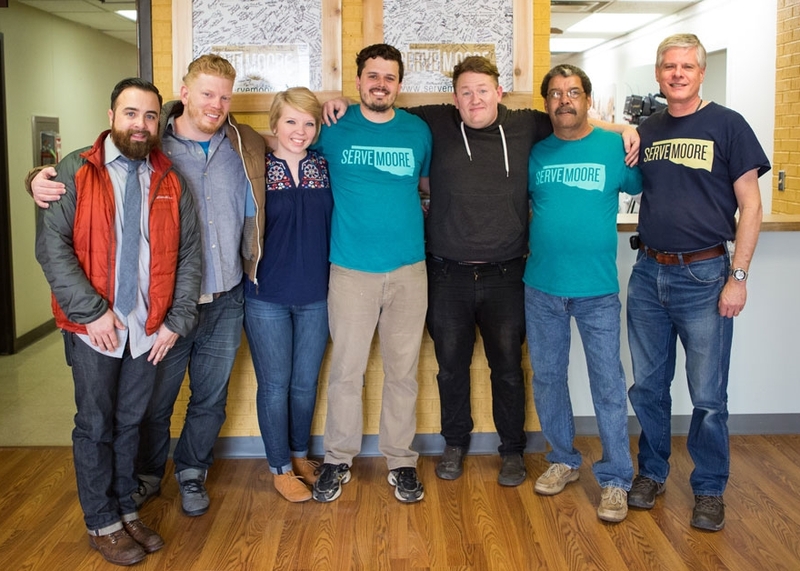 You can visit servemoore.com/help to fill out a short form to inform us about your need, or come visit the Moore Community Renewal Center at 224 S Chestnut Ave in Moore or call us at (405) 735-3060 to learn more about us and speak with somebody about how we can help! Another two weeks of summer break, another two weeks of work done! This week, Serve Moore welcomed 5 teams from across the country: Experience Mission, Next Step, Hamblen Park Presbyterian Church, Mission Academy, and Project Compassion. Despite the temperatures reaching 102 degrees, these teams clocked an impressive 1,805 hours and helped residents save $28,389! Hamblen Park was the biggest volunteer team last week, with 26 volunteers putting in 728 hours! 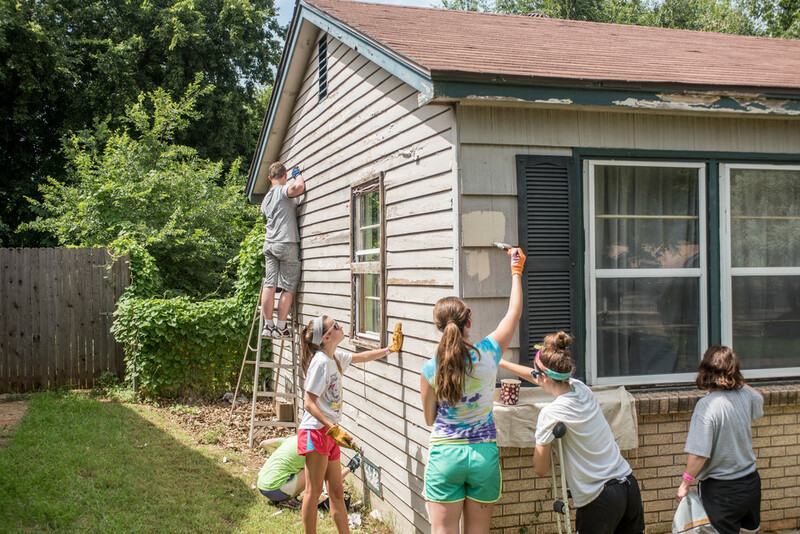 Throughout the week, they worked on projects at six different homes, including painting two sheds and painting the inside of a house. They removed 7,500 pounds of debris, or almost 300 pounds per person at Forest Park Mobile Home Estates. Hamblen Park also spent time at the Moore Food & Resource Center, serving 8,085 meals to 365 people, saving over $2,500! 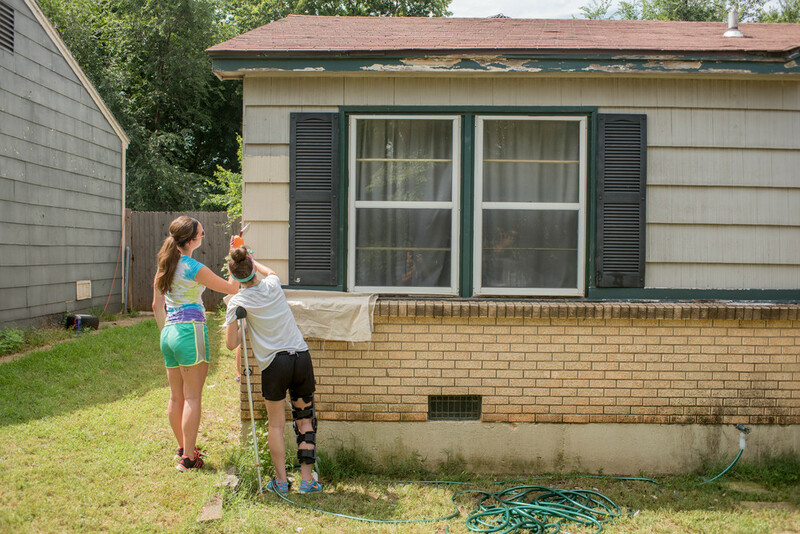 Experience Mission brought 11 volunteers and spent 308 hours working on several homes across the OKC metro. They completed a fence that was destroyed in the May 2013 tornado, tarped a roof, and worked on two other fences. Volunteers removed 1,300 pounds of debris from three different muck-out projects; over 100 pounds per person! They also spent time at the Moore Food & Resource Center, serving 572 people 14,308 meals. Through all these projects, they saved $6,605! Next Step’s 12 volunteers worked 336 hours, saving homeowners $4,800! Working at two job sites, Next Step completed a fence damaged by March 25 storms, and hanging sheet rock inside of a house. 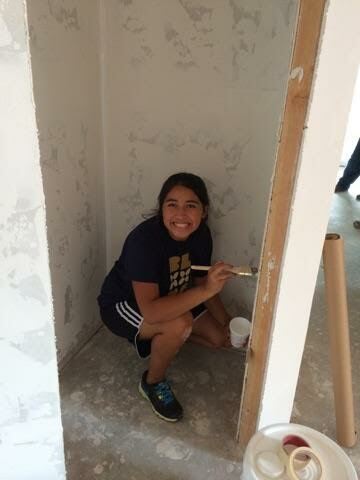 Mission Academy brought 11 volunteers, put in 385 hours of work and saved a local homeowner $7,150! They re-sided the entire outside of a home that suffered damage in the March 25 storms. The original siding was so old, however, that it was impossible to match! Mission Academy replaced it with all-new siding on all sides of his home, and painted it all to match. Project Compassion, a small but mighty team of 6, spent 8 hours this Monday completed painting the inside of the home Hamblen Park worked on last week! They are a youth boys trip who came from Rochester, New York on a 14-day work trip, stopping at communities across the U.S. In their combined 48 hours of work, they saved local residents $1,100! After 720 bottles of water, 77 Chic-Fil-A sandwiches, a few dozen red, white, and blue cupcakes, and over 1,800 hours of labor — all through heat and rain — we realize yet again just how blessed we are to have such wonderful volunteers! We hope that everybody had a great and safe Fourth of July weekend, and can’t wait to see what next week’s volunteers bring! If you are interested in helping in any way you can, whether that be with time or funds for supplies, or if you are searching for help after this week's weather, contact us! When we receive a respite from the rain, what do we do? Offer Serve Moore volunteers some water then go out and work! This week, teams focused on debris removal, the Moore Food & Resource Center, tarping leaky roofs, and repair on a home that was still feeling the effects of the May 2013 tornado. After guzzling nearly 500 bottles of water, volunteers spent over 1,400 hours serving and saving the residents of Moore right at $20,000! In a feat of strength, IM Change Mission’s team removed a total of 10 tons of debris, 5 tons of that being metal in Forest Park Estates Mobile Home Park in SE OKC. This means each volunteer removed 645 pounds of debris! By completing 651 volunteer hours, this project saved residents almost $14,000! When some volunteers couldn’t stand the heat, they moved into the kitchen. The Moore Food & Resource Center, a branch of the Regional Food Bank of Oklahoma, is a hunger relief agency in Moore. This Serve Moore partner is located on N. Shields Blvd and serves the south OKC metro. This week’s volunteer teams spent a combined 255 hours at the Food & Resource Center serving 10,535 meals to 129 families. Moore residents still feel effects from the May 2013 tornado, and Serve Moore volunteers still answer the call to help. 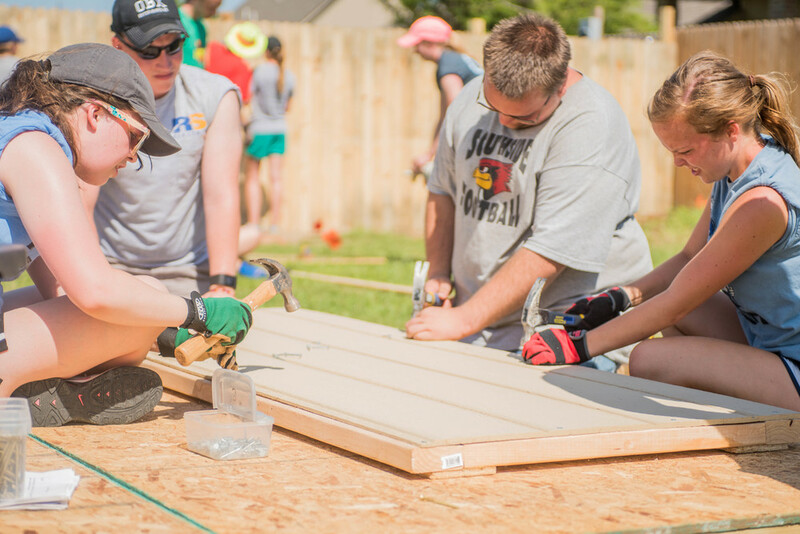 Experience Mission’s team worked at a home rebuilding a fence and a shed. This added up to $3,000 of savings to the homeowner: $1,600 for the fence, and $1,400 for the shed. 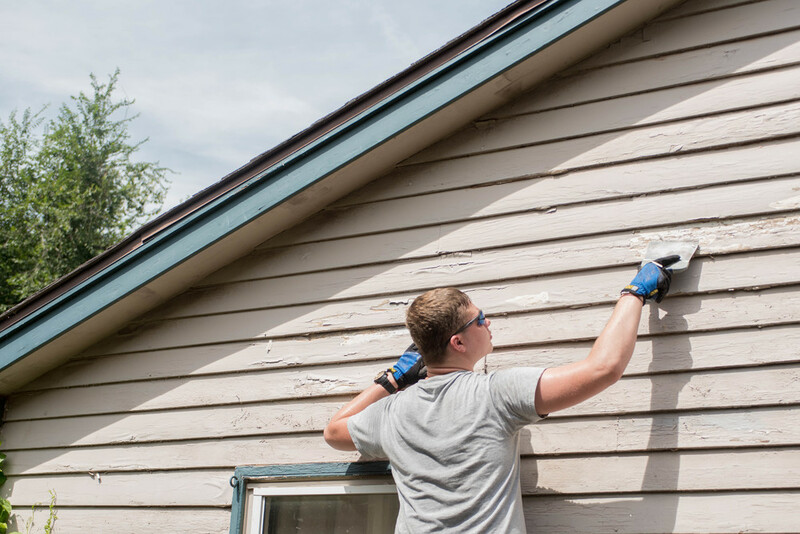 Although the monetary savings are major, the feeling of security from the fence, the extra space and organization from the shed, and the lasting impression these volunteers left on this homeowner are priceless. Experience Mission and IM Change volunteered their time, materials and labor to this week’s projects, and have changed the lives of local residents. Still, there is more work to be done. If you are interested in helping renew Moore in any way you can, whether that be with time or funds for supplies, contact us! Even with Oklahoma’s unpredictable weather and out-of-season rain, Serve Moore volunteers have kept busy! All of our amazing volunteers clocked over 700 volunteer hours, and in turn, saved residents over $15,800. 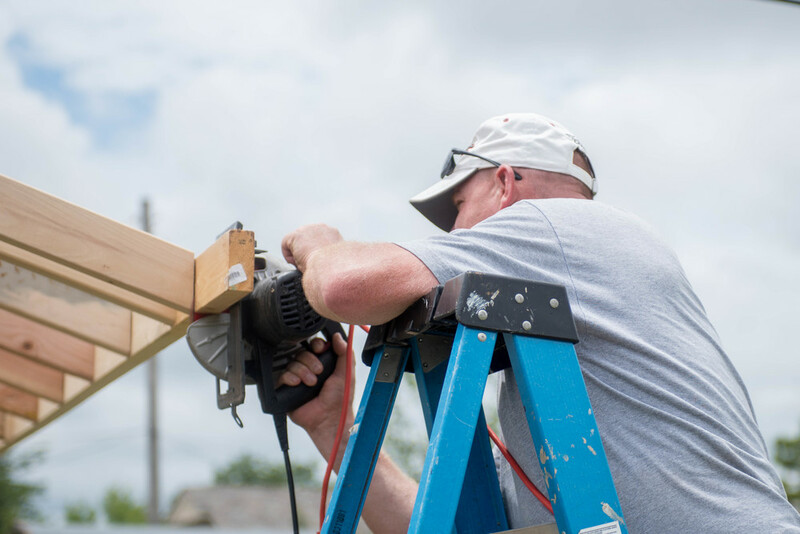 Throughout the week, volunteers replaced a roof in South OKC that was damaged by wind in the May 2015 storms. Even with more rain coming down, our volunteers were able to complete the entire project in only four days! They also completed work on fences throughout the city- installing posts, panels, and gates. When the rain was too heavy to work outside, our volunteers still aided at Serve Moore HQ building shelving in a storage room and prepping a new office space, as well as building shelving in a storage room and repairing drywall at Moore Community Church. Our largest project this week involved another home that was damaged by wind and water in the May storms. Volunteers tarped the roof to prevent further leaking, since the entire home had been flooded and covered in black mold. A team helped the homeowner move any salvageable furniture to a nearby storage unit, then tore out sheetrock, carpet, insulation, and other materials that could possibly retain mold. With 115 hours of work completed, Serve Moore volunteers saved the homeowner $6,500 through damage control and mold remediation. Even when it seems our work is done, Oklahoma weather throws us a curveball! Earlier this year, we completed a shed build that to replace what had been completely destroyed by the May 2013 tornado. Just a few weeks after completing this shed, the March 25th tornado took out the shed again! The team was able to salvage some materials, but essentially built another shed from scratch. Even though Serve Moore volunteers give their valuable time and energy to projects like this, some find other ways to help homes in need. Serve Moore would like to give a special thanks to partners like Emmaus Baptist Church and Experience Mission for funding construction materials, the homeowners who asked for help and helped with materials but found savings in free labor, and as always, the wonderful people, organizations, and churches whose donations keep Serve Moore going! These days, we all try to "Shop Local" or "Eat Local" as a way of supporting small businesses, energizing the local economy, or because we know someone connected to the business. But have you ever thought you can also "Give Local" too? Consider this: small charities or organizations are commonly local establishments run by locals to lend a hand to local people! Take Serve Moore for example. Every dollar you give to Serve Moore is used by the local guys & gals who run the operation. We buy everything we can locally; supporting local businesses and energizing the local economy. Those supplies are used to help renew local homes, local parks, and local businesses. Even when we can't use volunteers, we choose local contractors to do the job. We work hard to stay local. *in case you lost count, we used the word "local" 12 times in that last paragraph. That's a lot of local focus! The bottom line is this; donations you make to charities are precious. Make sure that you find a hard-working, local charity about which you can be passionate and to which you can be generous. If you live in Central Oklahoma, or if you happen to be passionate about the people here recovering from multiple disasters, we would be honored to be your charity to which you can "Give Local." Serve Moore debuts the new Serve Moore Truck at the Norman, OK '89er Day Parade. The truck is a joint venture with Cabot Creamery and local automotive & arts businesses to encourage volunteerism in Central Oklahoma. Last year, 62.6 million Americans volunteered through an organization. That's 25% of the population giving their time to help others. And that's no small chunk of time — 7.7 billion hours in all. What's more, that same year saw 138 million American informally volunteer in their communities. That's 62% of the population who watch a neighbors kids, helped someone with shopping, or mowed a neighbor's lawn. Those are indeed encouraging statistics! But, as with most things, there's room to grow. One of the questions we get asked the most at Serve Moore is this: "How can I start something like this in my own hometown?" Let me boil the answer down to one, core idea: Volunteer for it. See, we never intended on starting an organization, we never intended on building this website, and we certainly never intended on doing this for going on 2 years! We simply wanted to volunteer to make life after a disaster a little easier on our neighbors. It just turns out that lots of other volunteers had the same idea so we did it together. So by now you've gotta be wondering: "What do a Vermont dairy cooperative, an old '57 Chevy, and an accidental community service organization have in common?!" Well it's pretty simply actually. Our friends at Cabot Creamery in Vermont have long had a passion for volunteerism and in 2012, launched a program called Reward Volunteers to encourage people to better their communities by getting involved with local organizations. Since it began, volunteers have logged more than 200,000 hours in the program and won prizes for themselves and for the organizations they volunteered for! So the project began. An old '57 Chevy was on it's way to becoming the new Serve Moore Truck and to launch the effort to encourage people to get out in their communities and make them a better place to live. Well, you should know that as soon as we started talking to local shops about doing some of that work, they couldn't wait to get on board. Loomis Automotive in OKC took on the total restoration of the truck and had it up and running after sitting for 10 years! They really are the best restoration shop in town. They brought in folks like Modern Wheel and Brake Alignment in OKC and O'Reilly's Auto Parts in OKC. And friends of ours joined in too! Topps Powder Coating in Moore, Flair Body Works in Moore, Malibu's Auto Accessories in Moore, and Dusty Gilpin from Tree + Leaf Clothing & Printshop in OKC — all these businesses have been incredible in their efforts to renew the truck and along the way help us launch this great project! What does all this mean? It means that just like when Serve Moore got its start, we want to encourage you to volunteer in your community. All we did to start Serve Moore was to pick up a rake, put on a pair of gloves, and start picking up debris in lawns around town. We really just found a project & people that meant a lot to us and started working to help them where they needed it. Certainly, the story grew from there and lots of people ended up coming to #ServeMoore with us. But that just made the whole thing more fun! Our goal over the next several months is to encourage you to #ServeEvenMore. Look around. Grab some friends. Do something to make someone's life a little better; something in your community a little cleaner or prettier. There are so many ways to volunteer in your community. If you're from Central Oklahoma, we know of some really great options! You might check out the Moore Food Resource Center or the Regional Food Bank. Or for a wider variety of volunteer needs, you can register at Volunteer Central Oklahoma — the United Way of Central Oklahoma's awesome volunteer hub! Not from around here? Check out Cabot's own Reward Volunteers platform where you can find non-profts from all over the country! Here's the skinny. All you need to have to volunteer is the desire to help someone and the energy to get up and make it happen. You don't have to reinvent the wheel and you certainly don't have to start a movement. You just need to find something or someone you're passionate about and get busy working for good. Follow along as we spend the next several month encouraging volunteerism and helping you find ways to #ServeEvenMore! Check out photos of the progression of the Serve Moore Truck at all those various shops and locations! Then see the debut in the Norman, OK '89er Day Parade on Saturday, April 18th! Jaycen (7) and Zaria (3), along with parents Corey and Alissa, hand out water and cookies to Serve Moore volunteers responding to the March 2015 EF-2 tornado in Moore, OK. Their family home was destroyed in the May 2013 EF-5 tornado also in Moore. It's been one week since a small tornado and fierce straight-line winds tore into the homes and lives of hundreds of people here in Central Oklahoma. And yet, we cannot describe the feeling of immense honor we have felt since then. When Serve Moore got it's start as a hashtag in 2013, not a single person showing up those days could have ever imagined the way this story would unfold. We looked around and saw our neighbors in need of help. We looked around and saw tens of thousands coming to give that help. We knew that was our calling — match the people who needed help with the people coming to give help. Since then, we've been working toward renewal. All of us — whether you lost everything or nothing at all; whether you traveled from afar to help or you live here. We've been working not just for recovery but for something bigger. We've banded together as a community and we've shown the very definition of resilience. Then, a week ago today, more severe weather; another tornado. The call for help went out again. But this time as volunteer teams went out, we've recognized many of your faces. You who lost everything in May 2013 were now showing up in March 2015 to give back. As we gathered to again remove debris, secure homes, and love on people instead of accepting volunteers, you came to BE the volunteer. We can't say thanks enough. We can't describe how honored we are to work alongside you. To everyone who has given time, effort, cash, goods, whatever — you are what makes Serve Moore possible. Keep it up guys. In the coming days, Serve Moore will move past response to this storm and back into renewal. We will begin fixing fences, rebuilding sheds, making home repairs, and putting life back together in general. There's still PLENTY to do and we'll need CASH to do it. So whether you can give time, funds, or both — join in. It takes all of us to ‪#‎ServeMoore‬ and we wouldn't have it any other way. We at Serve Moore were as caught off guard as many were by the sudden development of several small tornadoes in Central Oklahoma earlier tonight. Firstly and most importantly, our prayers are for all Oklahomans who have suffered as a result of severe weather tonight — the numerous homes affected by the storms and sadly the loss of life in Sand Springs. We are communicating with the Cities of Moore and Oklahoma City emergency management departments and have offered help. The Serve Moore team is working on a volunteer plan for Thursday, March 26th that will likely include: tarping roofs, minor home repairs, and debris removal. We will be following up tonight with more detailed information for volunteers looking to help. No matter where you find yourself in tonight's weather, there's something you can do. If you need help, ask us and we will do all we can to help you. If you want to give help by showing up to volunteer, we will share more info with you tonight and tomorrow. If you want to give help by donating, your donations will be used to directly assist those affected by this and any future disasters in Central Oklahoma. In the time since the May 2013 tornados, so much has been accomplished! 50,000 volunteers have met more than 4,000 needs for 2,200 residents. They've built fences, storage sheds, playgrounds, gardens, and benches. They've hung drywall, rolled paint, laid tile, nailed shingles, and installed siding. Hundreds of homes and public spaces stand renewed because of volunteer efforts. But much is left to be done. Our list of needs is stacking up. Residents call Serve Moore HQ regularly asking for volunteer help to finish their recovery and move back into their home. Some have run out of insurance money (which was lacking to begin with); others have been victims of contractor fraud; and still others simply didn't know where to look for help until now. We're asking for your help to attack some of the needs on our list. Ideally, we're looking for teams of 8 to 10 people to give 2 or 3 days serving alongside us. These needs require some skill but if each team has a few skilled folks, we've found that works out just fine. We're listing some of the specifics below but a few ideas that top the list are -- 40 sheds to build -- a dozen fences to build -- lots of sheets of drywall to hang. Would you consider organizing a small group of volunteers out of your church, civic organization, workplace, or family? We'll be working on projects all through the winter (for the most part, Oklahoma winters are mild) and into the Spring. We would love to help these tornado victims finish off their recovery and get back to a somewhat-normal life. You know how they say, "All good things must come to an end?" Yeah, I don't think "they" really understood good things. Good things are important. Good things can be contagious. Good things bring people together. Serve Moore Saturday is a good thing. Rather, it's a bunch of people doing MANY good things. In the last 15 months, Moore has seen tens of thousands of volunteers cross city, state, and national borders to come serve in the wake of a devastating EF-5 tornado. These people coming to serve our city has been a good thing. Eventually though, all those volunteers go home -- back to their cities, states, and nations. But remember -- all good things do NOT have to end. You and I still live here. You and I still know people suffering. You and I still want to keep Moore a great place to live. So it's you and me -- and our families, friends, and neighbors. Let's keep this good thing going to #RenewMoore! Let's push to get hundreds of people together for October's Serve Moore Saturday and make a huge difference in our community! Invite everyone. Even if you helped at Serve Moore after the tornado, there's still PLENTY to do! Join in on October 25th from 9am till 3pm at 200 S Howard Ave, Moore. We promise to treat your information with respect.